Nail removal surgery may sound like a complicated and scary process. In reality, however, you can undergo the procedure without experiencing pain since it’s done under local anesthesia. If you’ve been advised by your doctor to get your nail surgically removed, here’s a quick guide to keep you as informed as possible prior to the procedure. What is surgical nail removal? Nail surgery is a procedure where a part of a nail or the entire nail is removed. It’s usually done to treat traumatic injury or severe infection of the nails. However, because the nails are considered as protection of the fingertips and a part of their circulation, their removal isn’t always the first choice. It’s only considered when the damage is extensive and causing severe complications. Additionally, people who experience pain, redness, swelling, and presence of pus coming out of the nails are also considered candidates for surgical nail removal. If you have one of those conditions and your doctor suggested that you undergo the procedure, consider taking a bath or shower on the day of the surgery. If you are wearing nail polishes, remove them completely. Your surgeon needs to a get a good view of your nails as part of the assessment before, during, and after the procedure. As with any medical procedure, avoid drinking any alcohol. Eat a light meal and take your medications as advised by your doctor. Be sure to pick a pair of footwear that can accommodate a bulky dressing. And for your safety, don’t drive right after having the surgery. It’s best to avoid public transport as well to prevent injury to the affected area. If you have an existing medical condition, be sure to discuss it with your doctor. Conditions that affect the body’s ability to clot can cause complications during and after the surgery. You should also be open about your medical history. Tell your doctor about any past medical conditions you had, medications you are taking as well as your allergies. It can also help if you lay out your family’s medical history, particularly those related to bleeding disorders. You should also be clear about any surgery you had, like the removal of the appendix, gallbladder or kidney stones. Nail removal is typically done under local anesthesia. However, depending on your preference and the recommendation of your doctor, you can be put under general anesthesia prior to the surgery. How soon do I need to get it done? Where will you perform the procedure? What are the costs associated with it? You will be asked to lie down in a supine position with your hands placed on the armrest, palms facing down. Your finger will be cleansed prior to the administration of local anesthesia to the area. After that, a finger tourniquet will be placed on the finger’s base to prevent bleeding. Once the area is ready, your doctor will create an incision on the edges of your nails. He’ll use a small periosteal elevator to press on the affected nail bed. Using a hemostat, he’ll remove the nail. Just like any surgery, there are risks associated with the procedure. Bleeding is one good example. You may also be at risk of infection, pain, and swelling if the affected area isn’t cleaned properly. Some of your previous symptoms may return as well. You should expect to experience difficulty walking, too. This is normal on the few hours or days after the surgery. However, if you aren’t experiencing any relief even after a few weeks, consider letting your doctor know. Additionally, don’t expect your nail to grow back the way it used to be. It can become thick, rough, or grow back with a darker or different color. If you develop a fever, headache, muscle pain, and other signs of infection, contact your physician. Dizziness is something you should get checked out early, too. After the procedure, avoid exposing your nail or foot to excessive pressure for about 24 hours. After that, you can slowly resume your regular activities. Remember to take things slow and don’t stress out about having restricted activities for a while. Pushing yourself too hard can only cause more problems. To prevent infection, your doctor will prescribe antibiotics. Be sure to take them as advised. Don’t miss any dose and take them for the duration your doctor tells you. Avoid taking any pain medications you are not prescribed with. To relieve pressure, elevate the affected foot and leg while resting for 1 to 2 days after the procedure. This also helps reduce pain. In cleaning the wound, use an unscented soap or one made with gentle ingredients. You may apply a nonprescription antibiotic ointment to the wound after taking a shower. Keep the wound dry as much as possible to facilitate healing. Usually, it will take about 3 weeks for you to recover completely from the procedure. You can expect your nail to grow back soon and it should be healthy as long as you care for it properly. There’s nothing wrong with getting a second opinion, particularly if you feel confused and uncomfortable with the information your doctor discussed with you. Asking for a second opinion can serve as a reassurance on your part and your physician should have no problem recommending another expert. Don’t be afraid to discuss everything with your doctor and be as informed as possible. 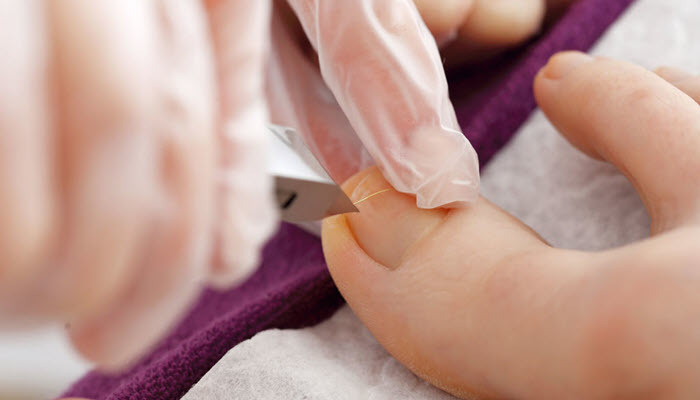 Even if nail surgeries are considered as minor surgeries, they still come with certain risks. They can cause complications, too.